You can have your PB&J and eat it too with these PB&J Superfood Energy Balls. 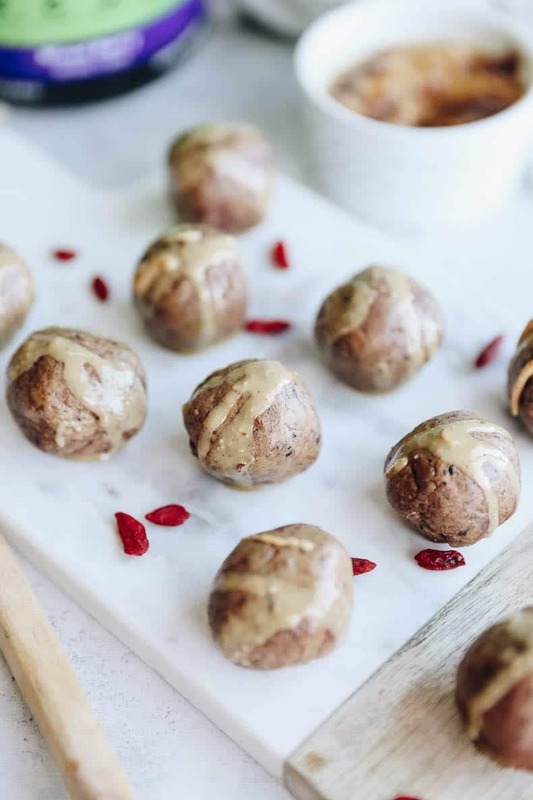 Packed full of nutrition and nature-based superfoods, you will love these quick and easy bites on the go. Disclaimer: This post is sponsored by GNC Stores. I was compensated for my time, however all opinions expressed are 100% my own. Thank you for supporting The Healthy Maven! I am a total believer in whole foods nutrition. I also lead a very busy life. Between the blog, the podcast, Camp Wellness and hosting events, I don’t necessarily have a ton of time to sit down and cook a farm-fresh meal everyday, let alone 3x a day. I’ve tried the whole meal planning thing, but honestly it doesn’t work for me. My weekends are my off time and while I respect anyone who wants to meal prep/plan, the idea of dedicating any part of my weekend to prepping for the week ahead isn’t my idea of relaxing. And that’s okay! As I sit here snacking on my PB&J Superfood Energy Balls, WHILE writing a blog post, I am reminded that most of us don’t have enough hours in a day to sit down to a home-cooked meal. While, C and I try to prioritize sitting down at the dining table and eating dinner together, most other meals are consumed on the run or while doing something else. And honestly, I don’t feel bad about it! There is so much guilt around what we eat, but also how we eat. I so appreciate the meals that I can sit down and enjoy, but I also appreciate being done at 5:00 PM everyday without being absolutely famished, because I didn’t have time to have a formal meal. Eating on the run or while I work, works for for me. Will it work for you? I can’t necessarily say, but I think it’s important that we experiment and feel empowered in making choices that work for us, regardless of how they make somebody else feel. 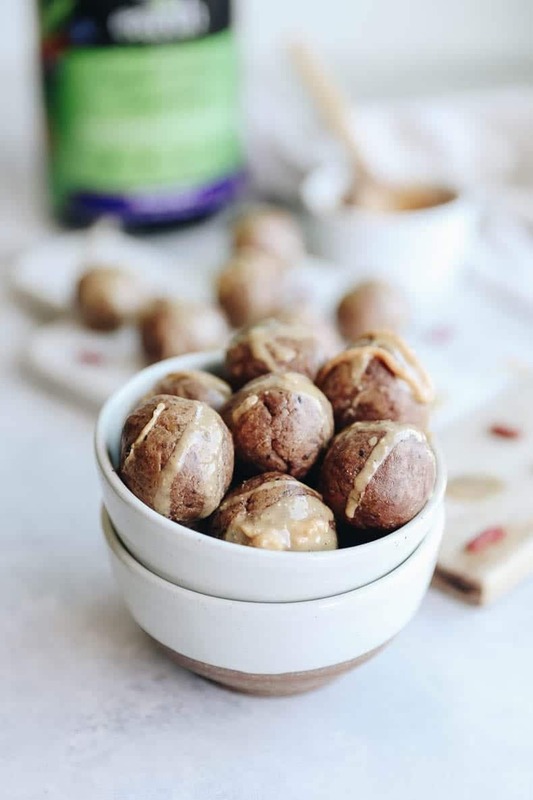 It also means getting the best bang for your buck, like these PB&J Superfood Energy Balls that are packed-full of nutrition all in an easy portable snack. 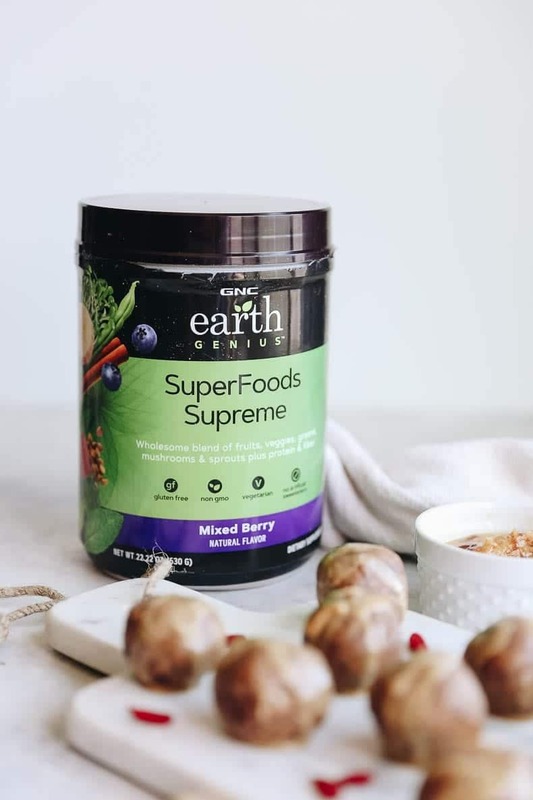 GNC Stores recently launched their Earth Genius line which features products like their SuperFoods Supreme that are inspired by nature and crafted by experts. All products feature wholesome ingredients and are non-GMO, gluten-free and have no artificial colors, flavors or sweeteners. They make your life easier rather than complicate it. The SuperFoods Supreme includes 35 different superfood ingredients, plus protein and prebiotic and enzyme support. It comes in Berry Flavor which works deliciously with the peanut butter in these energy balls. But if superfoods aren’t your thing (who ARE you?) fear not because the Earth Genius line offers a bunch of other supportive products including Energy TonIQ (for energy), Beauty TonIQ (for skin health) and Calming TonIQ (for relaxation). Earth Genius is exclusively available at all GNC stores. Be sure to use the code 34122 to save 20% off your in-store visit to GNC or click here to save 20% online. Offer open until 12/31 Enjoy! Add dates, peanut butter and SuperFood Supreme Powder to your food processor or high speed blender. Process until combined. Feel mix and if it’s dry and crumbly, rather than sticky, add in water 1 tbsp at a time until desired consistency is reached. 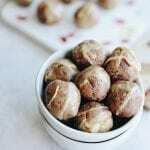 Roll into balls and store in fridge for up to 1 week or several months in the freezer. How do you eat your meals? Do you agree that we food shame HOW people eat?